The historic city of Aix-en-Provence is located just 30 km from Marseille France. With over 300 days of sunshine each year, Aix-en-Provence is an ideal place to enjoy its lively city squares, outdoor restaurants and cafes. 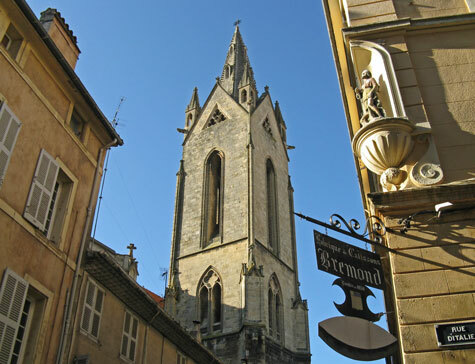 World-famous landmarks in Aix includes a beautiful belfry and astronomical clock. There is also a good selection of art galleries and museums featuring masterpieces by former resident Paul Cezanne and others. Visitors to Aix will enjoy some wonderful architecture, pretty fountains and tasty French cuisine. Plenty of good hotels are available in Aix-en-Provence. Aix is located just 30 kilometers from the Marseille Provence Airport (MRS). Frequent rail service is available from the Aix train station to Marseille, Nice, Paris and other European Cities. Enjoy our photographic tour of one of France's most popular tourist destinations!